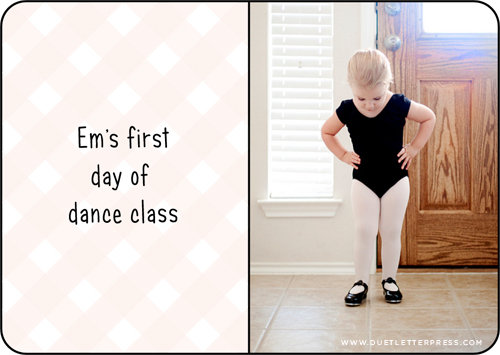 Yesterday was Em’s first day of dance lessons. She was so excited. After class she told me, “Mommy, I was dancing!” Her happiness melted my heart. This entry was posted on Tuesday, August 21st, 2012 at 12:25 pm	and is filed under miscellaneous. You can follow any responses to this entry through the RSS 2.0 feed. You can leave a response, or trackback from your own site. Oh the little leotard and tap shoes kill me! She is so sweet! That picture is so sweet and your girl is *adorable*! I can see the concentration and proud feeling as she dances! Hard to believe our babies are so close in age. P doesn’t look this grown-up, does he? She’s darling.